Lady Virginia C. Logan, a native of Harlem, NY, is the youngest of five daughters born to the late Matthew and Bertha Coleman. She attended the public schools of Harlem and graduated from Brooklyn Technical High School where she majored in Electrical Engineering. Virginia earned her Bachelor of Science degree from the Rochester Institute of Technology where she majored in Applied Mathematics and minored in Computer Science. Virginia also earned a Masters of Business Administration from the Fairleigh Dickinson University in New Jersey with a concentration in Marketing. Virginia participated in the UBS Fellowship Program for Professional Women held at the Wharton School of Business on the campus of the University of Pennsylvania. She is also a graduate of the Construction Management of the NYU Schack Institute of Real Estate. Virginia has over thirty years of professional experience in technical fields of software implementation, marketing and sales in the Information Technology industry as well as project/program/construction management. She served as an adjunct professor at New Jersey Institute of Technology (NJIT), Monroe College and Bronx Community College. Virginia also served the ACE Mentor Program where she worked with faculty, students and other mentors to expose high school students to careers in Architecture, Construction and Engineering. She is a passionate advocate for excellence in education as evidenced in her motto of “Ever-living, Ever-learning”. She continues to encourage and challenge students, especially young ladies of color, to reach higher in their education. Although Virginia values her education and professional experience, what she values most is her personal relationship with Jesus Christ. Her gifts of administration, teaching, edification, discernment and leadership are exercised in ministry alongside her husband, The Rev. 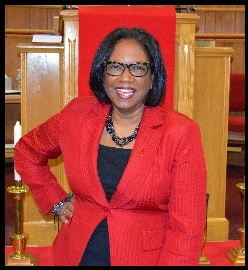 Dr. James B. Logan, Pastor of Messiah Baptist Church in Bridgeport, CT. She serves as a Sunday School Teacher and spiritual advisor to the Women’s Ministry. She is an advocate of building bridges across generations, believing we are “Stronger Together”. Continued spiritual growth and discipline are her heart’s desire. She continues to use and develop her gifts and talents wherever and whenever a door of opportunity is opened. Prior to her arrival at Messiah Baptist Church, she served in her home church, Convent Avenue Baptist Church in Harlem, NY, where she presided over the Marriage Ministry, coordinating the annual Marriage and Singles Relationship Conference, participated in pre-marital and marital counseling and coordinated weddings. Virginia was an active participant in the Women’s Ministry, Christian Education Ministry, a Sunday School teacher and led workshops and bible studies as requested. Virginia is active in the community having served in various capacities in her children’s school and extracurricular organizations, advocating for education, exposure, and opportunity. She led fundraising efforts for the American Diabetes Association, Gilda’s Club and several cancer organizations. She continues her support of health initiatives such as the American Heart Association Go Red for Women and mental and emotional health. Virginia and her husband celebrate God’s grace for their committed marriage of almost 31 years. Through this witness, they endeavor to reflect the relationship of Jesus Christ and His Church and encourage others to strive for healthy relationships and marriages. Her first ministry is to her family. She is the proud and blessed mother of two lovely young ladies, Olivia and Sydney, for whom she prays to leave a legacy of faith in both word and deed. Virginia prays for grace, wisdom and strength to do the work God called her and Pastor Logan to do in the Bridgeport community and she is confident of this very thing, that He which begun a good work will perform it…still believing that the BEST IS YET TO COME!